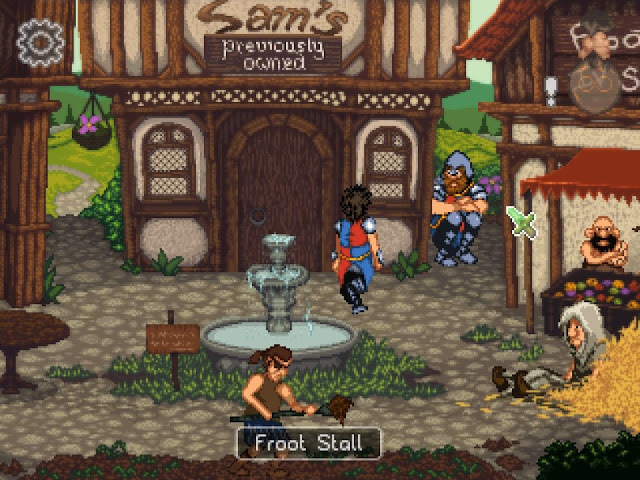 Indie Retro News: Guard Duty - Upcoming charming 2D fantasy adventure coming to Steam May 2nd! Guard Duty - Upcoming charming 2D fantasy adventure coming to Steam May 2nd! I've always been an Adventure gamer on both my Amiga and PC, and have such fond memories of games such as The Secret of Monkey Island, Simon the Sorcerer, Fable, Kings Quest and even the Quest for Glory series. So to hear that a new Adventure game with a fantasy twist known as ' Guard Duty ' by Sick Chicken Studios was coming to Steam May 2nd, I was most excited indeed! from the cobbled streets of Wrinklewood to a sci-fi universe the crumbling cities of Neo London. In it you take control of two protagonists living thousands of years apart, with locations ranging from enchanted Wildlands to Dystopian cities of the future! Guard Duty will feature over 6000 lines of voiced dialogue, hundreds of detailed animations such as the flicker of a candle or a leaf blowing in the wind, beautiful music and sound, handcrafted pixel art, and much much more!